We were clustered around one of several tables filled with sticky notes on a rainy day at the SXSWEdu conference. A senior executive at an afterschool non-profit and a researcher at a test development company were discussing psychometrics while two executives from a major game development studio listened in. They stopped halfway through the conversation to consult the other side of the table: an English teacher from Toronto and a high school student from Texas. The conversation shifted because teachers and students were invited to the table. Conversations about teaching with games (game-based learning) and learning about students through games (game-based assessment) are not new. What is new is the increasing focus on those educator and student voices at the table and an increased recognition of the importance of localized game-based education. The 2016 National Educational Technology Plan (NETP) covers some of these trends. In its section on teaching, the NETP highlights the work of one teacher in using text-based game creation tools to give his students voice. These students created simple games filled with their own culture, characters, and identity as a way to explore literary themes and storytelling skills. In the section on learning, the NETP highlights games that encourage students to assess and build non-cognitive competencies. The games help empower students to express their emotions, build strategies for self-regulation, and explore conflict resolution together. What these trends and examples both recognize is that students and educators are often the drivers of transformative learning using games. This is a fundamentally different approach to game-based education than some “sit and learn” models out in the field today. In this educational model, the games build on local relationships and activities to catalyze conversations into learning moments. These trends have spilled over into the world of educational game jams and hackathons as well. In a traditional game jam, event participants come together to create teams of developers, artists, designers, and subject matter experts. Each team builds an educational game, sometimes with input from an educator, which is then playtested by players and students. The game is then released out into the wild for others to play. Hackathon type events this past year have turned that notion on its head. 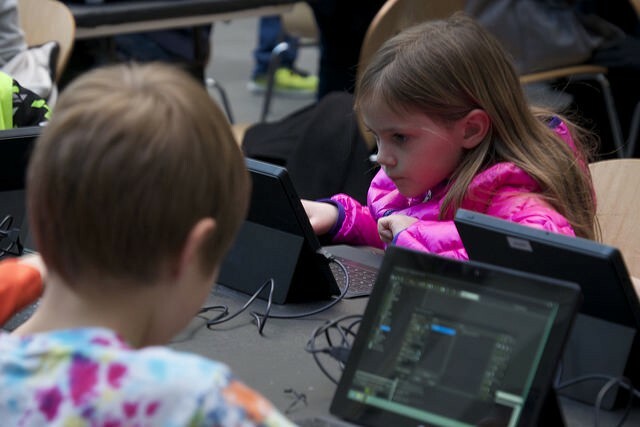 Instead of inviting teams of developers to build new games, these events have asked teams of educators to find new ways to leverage existing games. Participating teachers and librarians were able to find educational value in “entertainment” games just as they have in “entertainment” art, music, and literature in their classrooms and libraries. It turns out that software developers are not always the best at seeing what they already have. In all fairness, no one ever asked Hemingway to write a lesson plan. There are other benefits to having educators work in teams at these events as well. There is an opportunity for local teachers, librarians, and afterschool educators to come together to discuss game-based education. This can lead to complementary activities that bridge formal and informal learning and even result in short and long-term partnerships. In many cases, the developed learning resources can also be shared more broadly as openly licensed resources. Does an innovative lesson plan written in Detroit work for a class in Pittsburgh? How about in rural Montana? These conversations can help build a greater game-based education community of practice. As work in game-based learning and game-based assessment continues in 2017, we expect the field to continue exploring ways to highlight educator and student voices. We expect more game and testing companies to involve educators and students early and often. We also expect educators to continue experimenting with methods to leverage games that were not originally designed for the classroom. We expect an increased focus on game-based education rooted in local relationships. We expect educators to share their work openly and to continue to build a community of practice around game-based education. Most of all, though, we expect the conversations to continue. James Collins works in the Office of Educational Technology at the U.S. Department of Education. He works across a broad range of ed tech policy, from early learning to higher education, and also leads the office’s work on game-based learning and assessment as well as VR/AR/MR and maker education. He previously worked at the Smithsonian’s Center for Learning and Digital Access. The Office of Educational Technology (OET) provides leadership for maximizing technology's contribution to improving education at all levels.